I have spent most of the last week at the Big Data in Banking conference in Johannesburg, where I presented a paper on the role of the Chief Data Officer to bring alignment between Big Data business requirements and technology. It was refreshing to hear a number of other speakers also beginning to stress the importance of quality data, and a business lead approach to big data initiatives, rather than the pure “what is it” type talks that have been dominating these events over the last few years. Another trending topic was that of the use of machine data – the so-called Internet of Things (IoT). By 2019, Business Insider forecasts that the Internet will connect 35 billion “things” – most being thermostats, computers, vending machines, cars, robots, servers and heavy machinery. 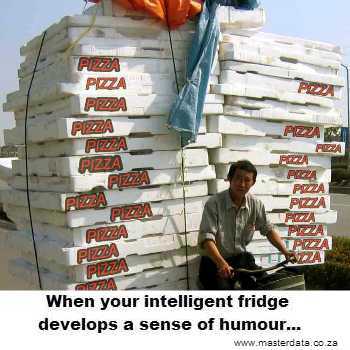 One of the most commonly used examples is that of the intelligent fridge. We are rapidly reaching the point where your fridge will not only be able to identify when you are running low on milk, and place an order for a replacement via your Internet shopping partner, but will also be able to identify risks to your health based on what you are eating. The potential is fascinating – but it does raise the question of who will be liable for any orders placed in error – or, if your fridge develops a sense of humour, in jest! Driverless cars are another IoT technology that will become reality within the next decade. Or should I rather say – self driving cars? Imagine the disruption to the motor and taxi industries when multiple commuters can share a single self driving cab? Datameer’s customers, across multiple industries, are using their IoT Big Data to enhance customer service, generate more revenue from new products and services, optimize operations, feed more data into existing analytics efforts, and save more than $100 million a year.